Material handling systems provide the link between your raw material storage and the manufacturing process. Having the correctly designed and built system can make your operation more efficient and safer. Mech-Chem's material handling systems are better because they have a standard basic design with strong structural components which can be easily modified to meet the geometrical requirements of your manufacturing operations. 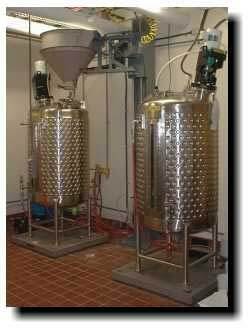 The basic design is a Mechanized Feed Hopper designed for the measurement and dispensing of dry chemicals. The system features construction that allows it to be easily cleaned, provide highly accurate measurements, and reduces lifting and materials handling requirements for employees. And being custom designed doesn't make it more expensive - because the system is a standard design that is custom built, you will find that our systems are less expensive and more reliable than standardized modular systems which may require you to purchase features that you don't need. Mech-Chem can design and construct a material handling system which can accurately weigh and handle dry materials and chemicals for loading batch processing, mixing and compounding tanks and reactors. Mech-Chem Associates, Inc., 148 Main Street, Norfolk, MA 02056. Tel: 508-528-5990; Fax: 508-528-8972.